The Senior Walk, a tradition of Peoria, Illinois’ Bradley University, has become the basis of a new tradition at Peoria’s First United Methodist Church. 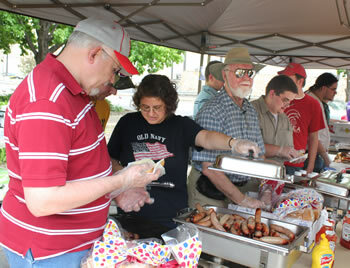 As Bradley students walked Peoria’s downtown on May 12 in celebration of graduation, the church served them a free meal of brats in their parking lot. This was the fourth year for the church to do this, in part to thank those students who have volunteered at the church’s soup kitchen and pantry, Loaves & Fish. 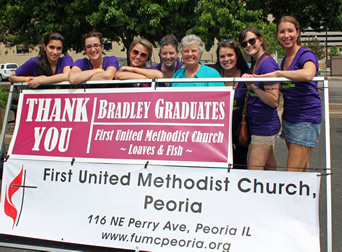 “Bradley students have been doing Loaves & Fish for a really long time,” said Colleen McDonnell, a Bradley Senior and First United Methodist Church volunteer, “and now this is a great way for them to give back to us in honor of Senior Walk. This is a great stop for us…Everyone’s hungry…It was really nice of them to do this for us.” Rev. Eric Swanson said it is a joy to interact with students as they stop for a snack and a rest. More than 400 students were served.